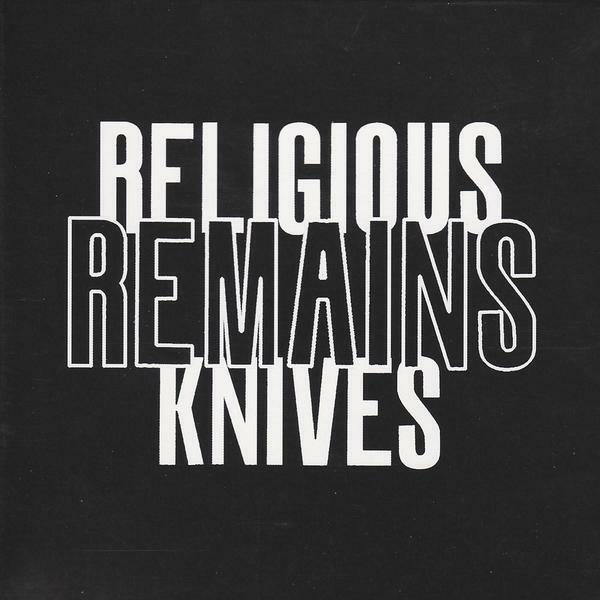 I love Religious Knives, and apart from having a simply awesome name they make some of the most delicious noise I've heard all year. Consisting of Double Leopards stalwarts Mike Bernstein and Maya Miller along with Nate Nelson of percussive noise troupe Mouthus you know you're in for something special, but quite how special this is could never be predicted. Released on Carlos Giffoni's immense No-Fun imprint the signs were good for something of a 'classic' release, but the depth of the album has just amazed me, and each time I play 'Remains' I'm sucked further into the murky depths and i'm convinced that this could even knock Double Leopards classic 'Halve Maen' off the droney, noisy top spot. For starters, 'Remains' isn't your typical noise record, it's not even that noisy actually, rather it uses distortion sparingly - synths are saturated with noise and fuzz, vocals are gargled hauntingly and that percussion, oh that percussion. The whole record sounds as if it's been recorded to Dictaphone tape in the 1970s and then brought out of retirement by a Dutch scientist; it has an eerie quality which is usually impossible to replicate and I have to tell you now, I'm totally in love. Hell, I can even hear echoes of John Carpenter in amongst the noise, those wonderful layers of bubbling synthesizer combined with the almost tribal pots-n-pans percussion, it's a soundtrack not to a film but to a drunken daydream, to the best and worst ideas you ever had. There's doom, there's grit, there's Krautrock, there's noise - but this album is way more than the sum of its parts, or the combination of sprawling genres, it's a dense, decomposing story of modern experimentation and I'm absolutely hooked. Don't sleep on this incredible record - if you're fans of any of the aforementioned albums you just can't let this one slip by. Essential!